The Vulcain® 2.1 engine, developed by ArianeGroup to power the main stage of the Ariane 6 launcher, for which the maiden flight is scheduled for 2020, has just been successfully tested by the DLR (German Aerospace Center) on the P5 test facility at its site in Lampoldshausen, Germany, on behalf of ArianeGroup. The Vulcain2™ rocket engine being prepared for the test firing. Photo is courtesy of ArianeGroup. 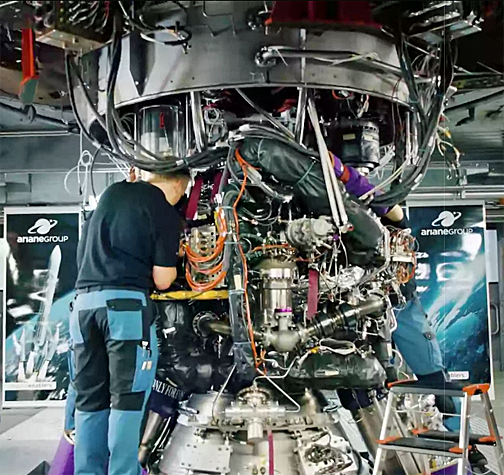 This is a version of the Ariane 5 Vulcain® 2 engine that has been especially adapted for the Ariane 6 main stage, to simplify production and to lower costs. To reach these objectives, the engine integrates technologies such as a gas generator built using 3D printing, a simplified divergent nozzle and an oxygen heater for tank pressurization. These adaptations contribute to achieving the cost targets set for the Ariane 6 launcher, while retaining the efficiency and reliability demonstrated on Ariane 5. 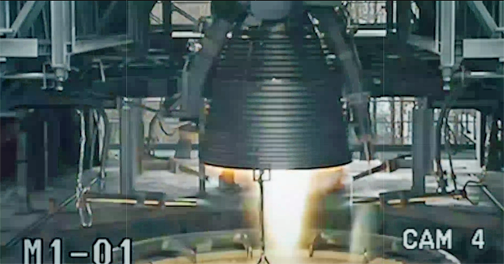 The Vulcain2® rocket engine test firing. In parallel, the Ariane 6 upper stage Vinci® engine qualification program is continuing on schedule, with more than 130 test firings performed on the two test beds in France and Germany (the P4.1 at the DLR’s Lampoldshausen site and the PF52 at the ArianeGroup test site in Vernon, France), including several demonstrations of the multiple ignition capability required by Ariane customers for their missions on Ariane 6.